This is a stunning example of Wm Burges's style of painted Gothic furniture, but is actually by JS Chapel, Burges's assisistant of many years, who completed many works on his death. The mirror comes from Lady Bute's bedroom at Castell Coch, where it was fitted into a wall bay & sat on a sideboard, see below. It shows great imagination, being immediately Gothic yet a totally new piece, with few references to past Gothic furniture. These 2 pictures show you how the proportions can be changed to suit your requirements. The painted shield design could also be changed. 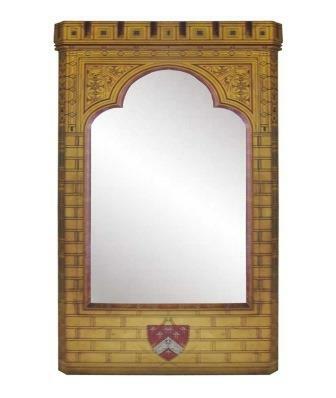 The mirror includes many Burges design elements. For all of the ornateness of the piece, it exhibits the best in Burges furniture, great shapes with ornate decoration on mainly flat surfaces to create a striking new design. While many today would consider such a piece too ornate & 'busy', the fundamental shape is quite simple, almost Arts & Crafts in style (which Burges was a big influence on). Having studied this piece extensively we could make an exact reproduction of it, or something close to this style but in whatever size & style & finish you want. This could also be made as a shallow depth cupboard, as the original was. Made to order, we don't give sizes until agreed with a customer.